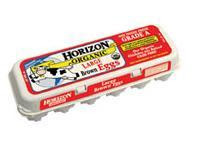 Today's giveaway is for a month's supply of Horizon Organic Eggs. All Horizon Organic products are produced without the use of antibiotics, added growth hormones, or dangerous pesticides. In addition, organic processing practices maintain the integrity of food without using preservatives or irradiation. Antibiotics are important in the fight against disease and infection, but they become less effective over time if they are used incorrectly or excessively. Therefore, the widespread use of antibiotics on healthy animals may lower their effectiveness in helping treat human illness. Organic farmers approach herd health holistically, treating animals without the use of antibiotics or hormones. The Union of Concerned Scientists estimates that of the 35 million pounds of antibiotics administered each year in the U.S., 70% goes to healthy livestock to stimulate growth and prevent disease. This massive usage could help develop super-strong strains of drug-resistant bacteria that can spread to people. Developed countries around the world, except for the United States and Canada, have set regulations restricting such use. In order for their land to be certified organic, farmers must not apply synthetic fertilizers, dangerous pesticides or other toxic and persistent chemicals to their land for three years prior to certification or anytime thereafter. That's why organic production greatly reduces the presence of pesticides in foods. Since pesticides have been used in conventional food production on a widespread basis, for a long time and because they linger in the environment long after application, there is no guarantee that any foods are pesticide-free. The issue of pesticide residues is particularly pertinent to children, who consume more food per pound of body weight than adults. They are also likely more sensitive to the effects of pesticides and other chemicals in food, due to their rapidly developing nervous systems. A study from the University of Washington and published in Environmental Health Perspectives found that children who ate a predominantly organic diet had far lower levels of pesticide residue in their bodies than the children who mostly ate non-organic foods. In fact, the children who ate more non-organic foods had pesticide metabolite levels six to nine times higher than those on organic diets. The cows that produce milk for Horizon Organic are fed 100% certified organic feed. In addition, the other ingredients in our products, including the fruit in our yogurt products, are grown on organic farms that do not use dangerous pesticides. 1. AMA Annual Meeting Resolution 508 Antimicrobial use and resistance. June 2001. 2. Yu, Herbert and Rohan, Thomas. Role of Insulin-like Growth factor Family in Cancer Development and Progression, Journal of the National Cancer Institute, v.92, September 20, 2000. 3. Baker, BP, Benbrook CM, Groth, E. and Benbrook, KL. Pesticide residues in conventional, integrated pest management-grown and organic foods: insights from three US data sets. Food Additives and Contaminants, 19:442-447, 2002. One winner will receive 4 coupons for free Horizon Organic Eggs, a month's supply! Remember to stop by Moody Mama Says and Everyday Baby Steps and enter their giveaways, then come back here and leave the link in the form of the giveaway you entered!